While the title of this work employs the umbrella phrase “sports supplements,” a better term would be “nutraceuticals,” which represents a kind of twilight zone between drugs and medicines on the one hand, and vegetable/plant foods on the other. “Nutraceutical” gained currency in the early 1990’s and is a portmanteau word derived from “nutrition” and “pharmaceutical.” Examples include everything from vitamins and minerals to fruits and vegetables to unpronounceable chemicals. Many health claims have been made for various products in this class of dietary aids, some valid, many being so much advertising hyperbole designed to make a sale. The outstanding feature of this book is a reliance on the scientific literature that either supports or refutes assertions of ostensible physical and mental wellbeing. A cursory review suggests that most, if not all, of said literature consists of peer reviewed scholarly journals, the articles of which, in turn, are based on carefully controlled human and animal studies. Book opens with an overview chapter entitled “Understanding Supplements,” which imparts such basic information as major classes of supplements, role of the Food and Drug Administration (FDA) in regulating this industry segment, and how to decipher the data listed on package labels. Chapter 2, “Keys to Peak Performance,” is a discussion of the factors, such as food and water intake, muscular function and so on as they affect the metabolism and physiology of the athlete. Bulk of this volume is contained in Chapter 3, which is comprised of an alphabetical listing of some 120 substances. A consistent format gives the supplement name in boldface type, followed by icons representing any of six performance factors and an “AKA” line of variant names. Sections on “What It Is” and “How It Works” are self-explanatory. “Performance Benefit” discusses health claims for supplement in question, while “Research” goes into some detail concerning scientific studies, their publication and a clearly worded verdict, if you will, on whether or not said claims hold water, in view of current findings. “Common Usage” details availability (pills, liquid, whatever), recommended dosage, potency and so forth. Each entry concludes with “Health Concerns,” which is exactly that: even perfectly safe supplements taken in normal doses can have untoward effects if taken in excessive amounts and some of this stuff is just plain bad news. The authors are refreshingly straightforward in their commentary, stating in black and white any known or suspected ill effects of these additives, even going so far as to include shaded text boxes labeled “Supplement Warning.” Lastly, Chapter 4 offers information on “Supplements for Special Groups and Environments,” which looks at the particular needs of, say, female or disabled athletes. Both authors are well qualified to write such a book, as they are both registered dietitians (RD designation), both hold advanced degrees in their fields and both hold a number of professional certifications. Mueller, especially, stands out, as she has been a past contributor to a number of nutrition publications and acts as a nutrition consultant. Overall, this is a very well written and documented work on nutrition science and should prove to be very helpful to anyone who wishes to separate the proverbial wheat from the chaff concerning foodstuffs. The one criticism to be made involves the fact that the list of references to the aforementioned scientific literature, for whatever reason, is not part of the book itself. Readers are required to consult the publisher’s website for this information, which is an inconvenience. That said, this book is well worth its stated price. Got this book from First Reads. 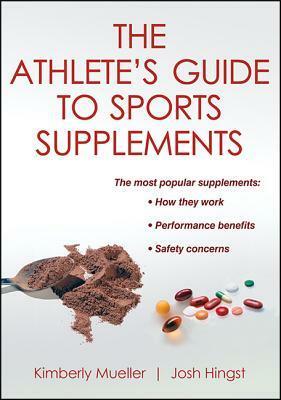 Great guide and resource on sports supplements. It not only details traditional supplements suggested by most professional trainers and coaches, but also alternative or less mainstream supplements that you might find in foreign fitness books. Whether they work or not, you can only find out after having tried them. Reading this gave me practical information about how to tweak my diet to accommodate an increased training schedule. The presentation is very balanced, with each supplement getting a fair overview of any research done to back the common lore. The author also explains how foods can supply the same elements.